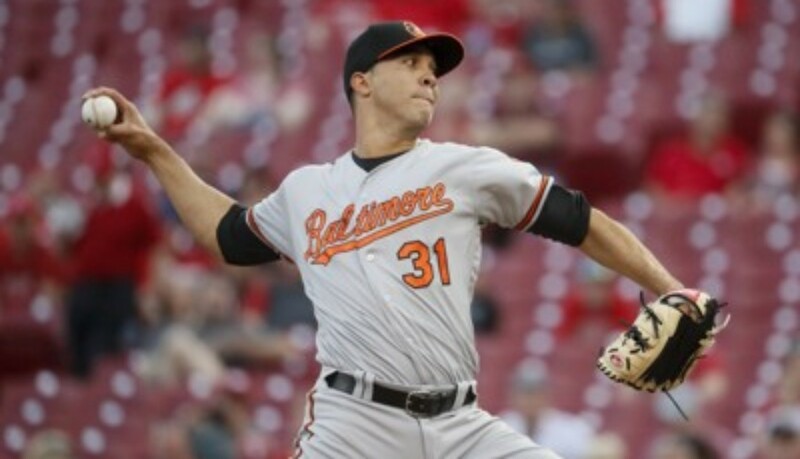 Orioles 2, Reds 0 : Him In His – Ubaldo Jimenez locks in the zone & shows his good side, pitching 7 2/3 shutout innings, he walks 4 & strikes out 3, allowing just 2 hits. He is in complete control all night, giving the Orioles staff a huge boost & giving Jimenez some much needed confidence. Ubaldo makes quick​ work of the Reds lineup, pitching a gem for the O’s after Kevin Gausman’s rough outing in Game 1. 2B Jonathan Schoop drives in a run on a single in the 2nd off of the Reds young lefty Amir Garrett, who strikes out 12 Orioles in 7 innings, he allows 2 runs on 7 hits, walking just 1. Ubaldo simply out pitches the young lefty & Manny Machado adds a sacfly in the 5th to give him a much needed insurance run. Brad Brach works the 9th to close it out, as closer Zach Britton sits on the 10 DL right now. The Orioles split the first 2 games in Cincinnati, the rubber game was tonight. 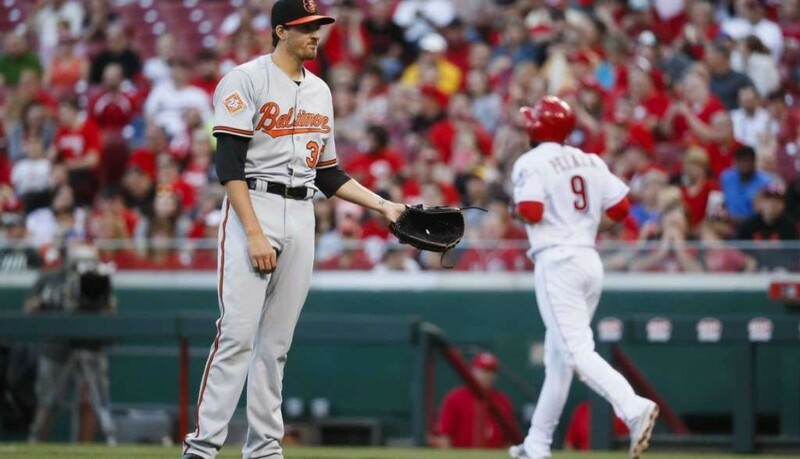 Reds 9, Orioles 3 : Seeing Red – Kevin Gausman is pounded for 8 runs on 8 hits in just 2 2/3 innings, including allowing a Grand Slam to left by Reds LF Adam Duvall (#4) in a 5-run 5th inning as Cincinnati pulls it out & destroys the Orioles in Game 1. Duvall drives in 5 runs in the game, adding a sacfly in the 1st as well. C Tucker Barnhart doubles in the final run of the 5th for the Reds & Joey Votto adds a 2-run shot to right (#4) in the 3rd to make it 9-1 Cincinnati. Gausman exits & is replaced by LHP Vidal Nuno, he walks 3 & strikes out 2. Cincinnati starter Bronson Arroyo goes a decent 5 innings, he allows 3 runs on 5 hits, he walks 2 & strikes out 4. Jonathan Schoop drives in a run on an single in the 2nd & Adam Jones hits a 2-run shot to left (#3) in the 5th, that would be it. The 40 year old Arroyo wins for the first time since June 15, 2014, missing the last 2 seasons w/ Tommy John surgery. Orioles 11, Blue Jays 4 : He’s the Mancini – Trey Mancini hits a pair of longballs & the O’s go deep 4 times as a team to rout the Jays & take 3 out of 4 in Toronto. Mancini hits a 3-run shot (#3) in the 6th to make it 4-0 O’s & give starter Dylan Bundy some added run support. J.J. Hardy doubles home Jonathan Schoop & OF Craig Gentry adds a sacfly in a 5-run 6th to make it 6-0. Mancini hits a solo shot (#4), Gentry hits a 2-run shot (#1) & Manny Machado adds another 2-run blast (#2) to make it 11-2 in a 5-run 8th inning. Dylan Bundy tosses 6 shutout innings, allowing just 5 hits, he walks 1 & strikes out 6. Mancini finishes 3 for 5 with four RBI, matching the major league record for home runs in the first 12 games of a career with 7, joining Trevor Story and Dino Restelli. Kevin Pillar hits a 3-run shot (#1) in the 9th for the Blue Jays to make it 11-4. Baltimore is now 5-1 against Toronto so far. Washington won the Southeast Conference, their first Division title in 38 years. Atlanta makes it in, due to their hard play, staying relevant enough the entire season. 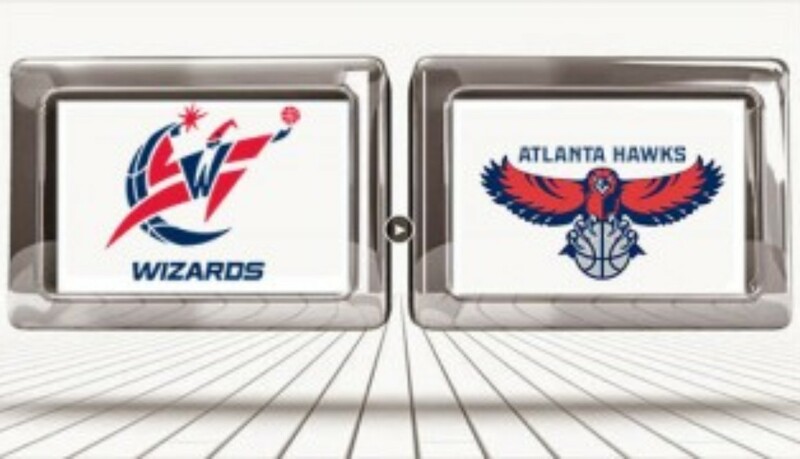 Key matchup : PG John Wall vs PG Dennis Schroeder. John Wall is one of the NBA’s most explosive G’s & wastes no time finding his teammates, Dennis Schroeder is a formidable opponent, one who can present problems & create for Atlanta. Washington simply has too many scorers, Wall, Bradley Beal, Otto Porter, Brandon Jennings, Markieff Morris & Kelly Oubre. Marcin Gortat will be a factor inside. Can Atlanta match the physical presence upfront by Washington? The answer is No. The Hawks do have Paul Millsap, but after him & Dennis Schroder there is alot to be desired by the Hawks in terms of being able to keep up w/ Washington’s scoring. My prediction : Wizards in 5. Washington should quickly dismiss of the Hawks, a this team has their eyes on the prize. The Washington Wizards wanna go to the NBA Finals. The Atlanta Hawks will be sitting home in a few weeks. There just is not enough firepower in this Hawks team right now..
See you in Game 1. Blue Jays 2, Orioles 1 : Bird Blast – Kendrys Morales hits a walk off solo homer to right center as the Jays win in extras in Toronto. It spoils an outstanding effort by starter Alec Asher, who goes 6 1/3 shutout innings in his Orioles debut. Asher allows just 1 run on 3 hits, he strikes out 5 & walks 1. Asher hits Jose Bautista & allows a single to Troy Tulowitzki before leaving in the 7th w/ 2 men on. Darwin Barney singles off of reliever Donnie Hart to score Bautista & put the Blue Jays ahead 1-0 in the 7th. Roberto Osuna comes on in the 9th to close it out, but allows an infield single to C Wellington Castillo, as OF Craig Gentry runs for Castillo & steals 2nd, moves up on a sacfly & scores on a sacfly by Jonathan Schoop as the O’s manufacture a run to tie it. Then in the bottom of the 9th, Morales walks it off (#2) against reliever Tyler Wilson to give the Jays their first win in the last 8 games. 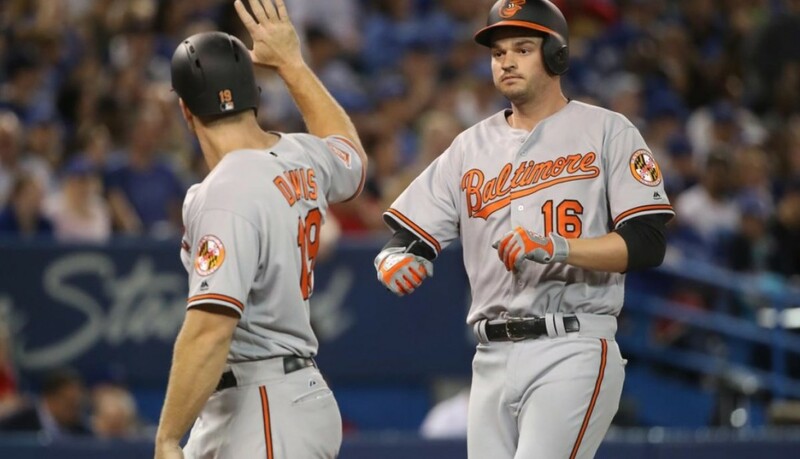 Orioles 6, Blue Jays 4 : O’s Canada – The Orioles continue to dominate Toronto as they defeat the Jays for the 4th straight time this year, rallying from a 3-1 deficit to comeback & win in Toronto. Justin Smoak singles home a run in the 2nd & hits a solo shot (#1) in the 4th to put Toronto ahead 3-1. Jonathan Schoop hits a solo shot (#2) & J.J. Hardy hits a 2-run blast (#1) to put the Birds ahead 4-3 in a 3-run 5th & Chris Davis hits a solo shot (#3) in the 6th to make it 5-3 & knock Jays starter Aaron Sanchez from the game. Sanchez goes 5 1/3, he allows 5 runs on 7 hits, walking 1 & striking out 3. O’s starter Wade Miley goes 6 innings, he allows 3 runs on 5 hits, striking out 8 & walking none, after walking 7 men in his last start. Seth Smith hits a solo shot (#2) in the 9th to make it 6-3 & Zach Britton closes it out for his 55th consecutive Save. Toronto has now lost 7 in a row. Orioles 2, Blue Jays 1 : Pitching a Fit – In a tightly contested pitchers duel, Kevin Gausman gets just enough run support & the O’s win already win their fourth 1 run game of the year. 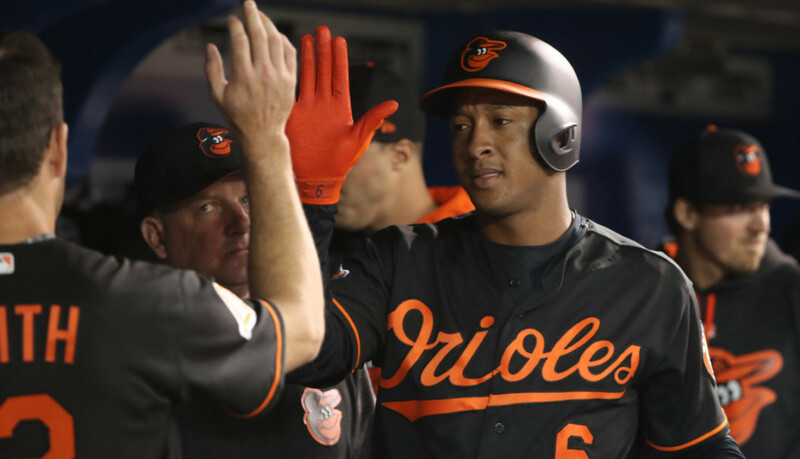 The Birds score twice in the 5th against Jays starter Francisco Liriano, as Jonathan Schoop doubles to center to drive in C Wellington Castillo & scores on a single by J.J. Hardy to make it 2-0 Orioles. Liriano strikes out 10, as the Jays lefty was on his game, despite a bad 5th inning. He goes 6 2/3, allowing 2 runs on 5 hits, he walks 2. Gausman is just as dominant, going 6 innings, allowing 1 run on 5 hits, he walks 2 & strikes out 3. Zach Britton closes it out in the 9th for his 54th consecutive Save in a row. The Orioles have now defeated the Blue Jays for the third time in a row this year & their 6-2 record is all against the AL East. Baltimore is off to a strong start & sits all alone in 1st place. 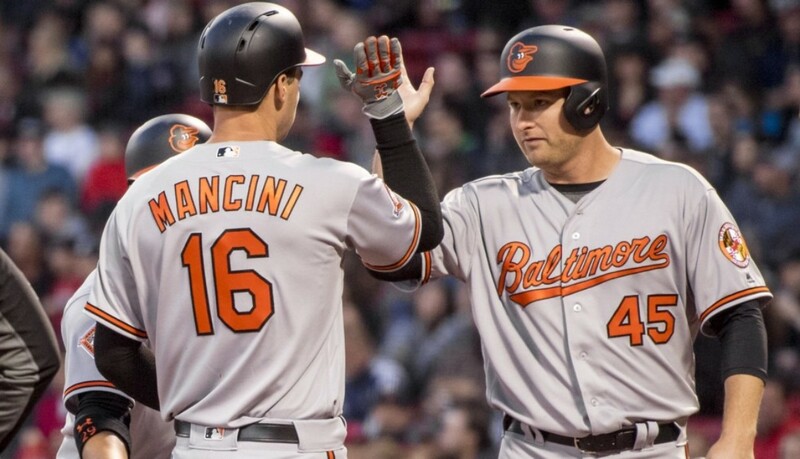 Orioles 12, Red Sox 5 : Deep Impact – The Orioles go deep 5 times, as Trey Mancini hits a pair of longballs, connecting on a solo shot (#1) & is followed up by Jonathan Schoop (#1) as the pair goes back to back in a 6-run 1st inning, all against Red Sox knuckleballer Steven Wright. Manny Machado also doubles home the first run of the game in the inning. Adam Jones tees off against Wright in the 2nd (#2) on a mammoth shot to left & Chris Davis also takes Wright deep to right center. (#2) to make it 8-0 after 2. Mancini homers for the second time (#2) in the 3rd to make it 9-0, but Ubaldo Jimenez can’t even make it through 5 innings & is pulled after just 4 1/3. He allows 5 runs on 8 hits, walking 2 & striking out just 1. C Wellington Castillo doubles to right in the 7th & scores on a base hit by Schoop to cap the scoring. Baltimore splits the short 2 game series in Boston & will now head to Toronto for 4. 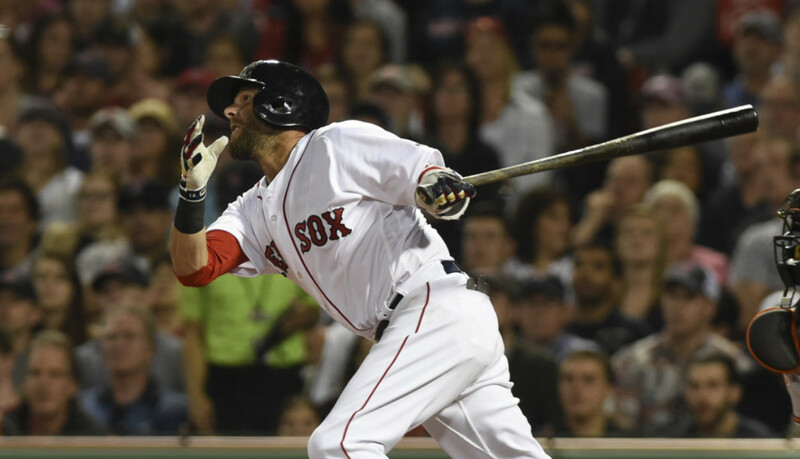 Red Sox 8, Orioles 1 : Boston Baked Birds – The Red Sox break the game open in a 4-run 7th inning & add 2 more in the 8th to coast on to the win @ Fenway. 2B Jonathan Schoop misplays a pop up that bounces off his foot & SS J.J. Hardy commits a crucial error on a doubleplay ball in the 7th, which loads the bases & then Dustin Pedroia drives in 2 on a single back up the middle that deflects off of Hardy’s glove to make it 4-1. 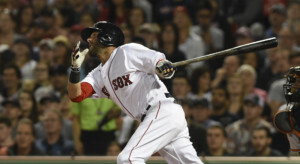 Pedroia drives in 4 runs in the the game. 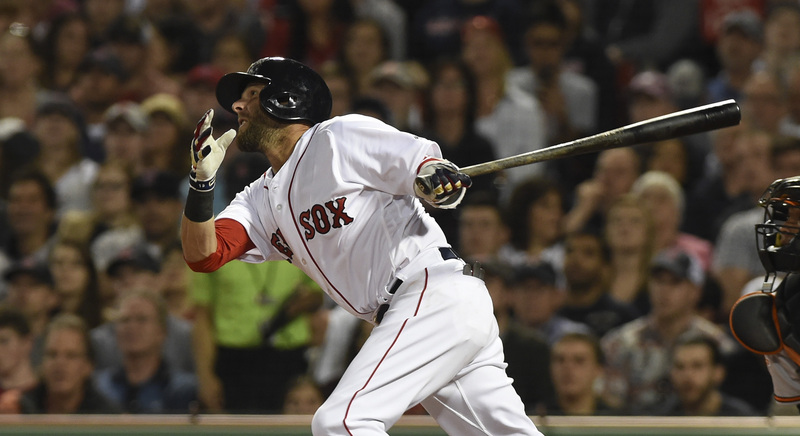 Red Sox starter Drew Pomeranz pitches 6 innings, allowing 1 run on 4 hits, he walks 3 & strikes out 4. C Christian Vasquez goes 4-4 w/ a double & a triple, he drives in 2, he also scores twice & steals a base. He triples home 2 in the 8th to seal the game. Dylan Bundy pitches 6 1/3 innings, allowing 3 runs on 7 hits, he strikes out 3 & walks 2. The Orioles have now dropped 2 in a row after starting out 4-0. Game 2 is tonight from Fenway. 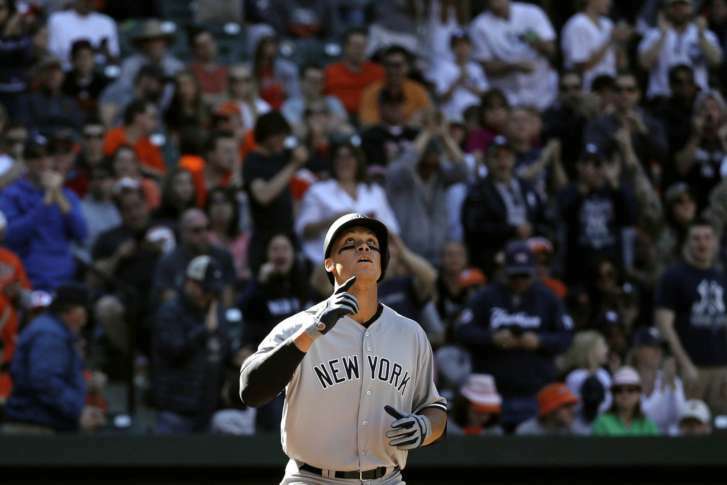 Yankees 7, Orioles 3 : Damn Yankees – The O’s jump out to a 3-0 lead early, but let it slip away late as the bullpen allows all 7 runs. The Yankees score 4 times against reliever Darren O’Day, who walks 3 & allows 2 hits & 4 runs in just 2/3 of an inning. SP Wade Miley walks 7 men in just 5 shutout innings, allowing just 1 hit, but still leaves w/ the lead after 5. 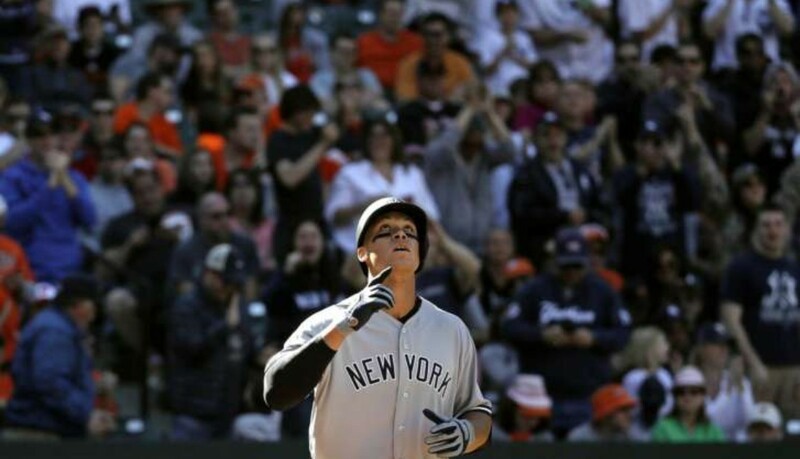 Reliever Tyler Wilson gives up a 2-run triple to Ronald Torreyes in the 6th & Aaron Judge hits a solo shot (#1) to tie it in the 8th & Starlin Castro singles in the go ahead run against O’Day in the 9th & Judge drives in another on a groundball. C Austin Romine hits a sacfly to right to drive in the go ahead run & another run scores on a throwing error by 2B Jonathan Schoop to give the Yankees a 4-run lead. The O’s lose for the first time this season, but still finish up the homestand 4-1 & will now ship off to Boston for 2 @ Fenway Park.